Complete your Guardians of the Galaxy costume with this plastic Star-Lord blaster from Rubie's! 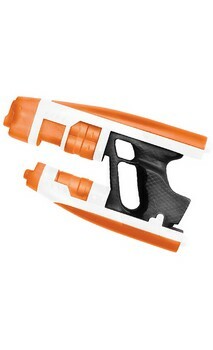 Plastic Star-Lord blaster measures 12 x 7 x 2-inches, orange and white for safety. Costume accessory, not designed for play. Officially licensed Marvel costume accessory. Look for other Marvel and Guardians of the Galaxy costumes and accessories from all of the saga stories, and in sizes and styles for the entire family, from Rubie's costume company. Complete your Guardians of the Galaxy costume with this plastic Star-Lord blaster from Rubie's! Plastic Star-Lord blaster measures 12 x 7 x 2-inches, orange and white for safety. Costume accessory, not designed for play.